The AEM 2102-B fits some Mitsubishi Lancer Evolution GSR models. See vehicle applications for details. 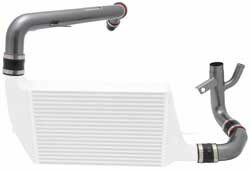 The AEM 2102 Intercooler is designed to significantly reduce inlet air temperature and provide more volume than the stock intercooler on certain Mitsubishi Lancer Evolution GSR models. This intercooler is designed using computational fluid dynamics with flow data and has an extra port in the intercooler discharge tube for auxiliary devices like boost pressure sensor, temp probe or water injection nozzles. Check your state laws for legality of water injection on your car. Included are the intercooler charge pipes which are part of a two part kit and both AEM part numbers 2102-A and 2102-B are designed to be used together. Use of one without the other voids the warranty.